Ursuline students have the opportunity to fashion a course of study from required and elective subject offerings. Through the Merici Schedule, students can be flexible in planning required and elective courses. Advanced Placement courses offer each student the opportunity to further challenge herself academically. 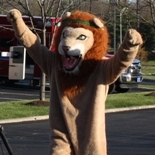 At Ursuline, in addition to preparing students for college work in a safe environment, AP classes give students the opportunity to discover passions and strengths earlier in their academic careers. With 75% of Ursuline’s faculty holding doctoral or masters degrees, students receive the most comprehensive and thorough tools for academic excellence possible. 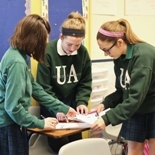 The 11:1 student to faculty ratio makes individual attention a key component of an Ursuline education. 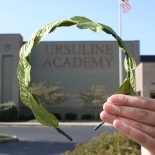 Ursuline's Bring Your Own Device (BYOD) program has been implemented with the 2016-17 academic year, requiring all students to bring a laptop to school as part of her class materials. 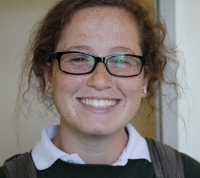 In keeping with Ursuline’s efforts to educate young women not just for school but for life, students were not issued nor were they required to purchase a specific device. Rather, the BYOD program allows students to select a laptop that meets their needs while also meeting certain specifications laid out by the program. Ursuline offers technical support to students along with training and consultation. 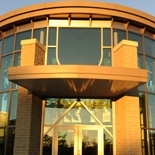 Ursuline’s library is an integral component of the academic life of the school. The librarian collaborates with faculty in designing research opportunities that help increase students’ confidence and abilities in researching across the curriculum. This is supported by an excellent collection of print and online databases as well as classroom instruction by the librarian on digital literacy and the responsible use of online sources. Ursuline enjoys a strong relationship with area colleges, universities and public library systems that provides our students and faculty the ability to borrow academic resources from these institutions. Ursuline alumnae consistently cite their excellent library research experience as a significant factor in their college success.